The straw fibers are certified weed seed free. Straw wattles are dense by nature, thus they pool water. Wattles may be placed across channel bottoms, but their primary use is on hill slopes to break up slope lengths and slow overland flow. *Custom sizes are also available upon request. When installed, WESTERN FIBER COMPANY wattles prevent off-site sediment runoff from construction areas, reduce slope length on hill sides, protect storm drain inlets, function as an alternative to sit fence for perimeter sediment control and also help promote vegetation after forest fires. 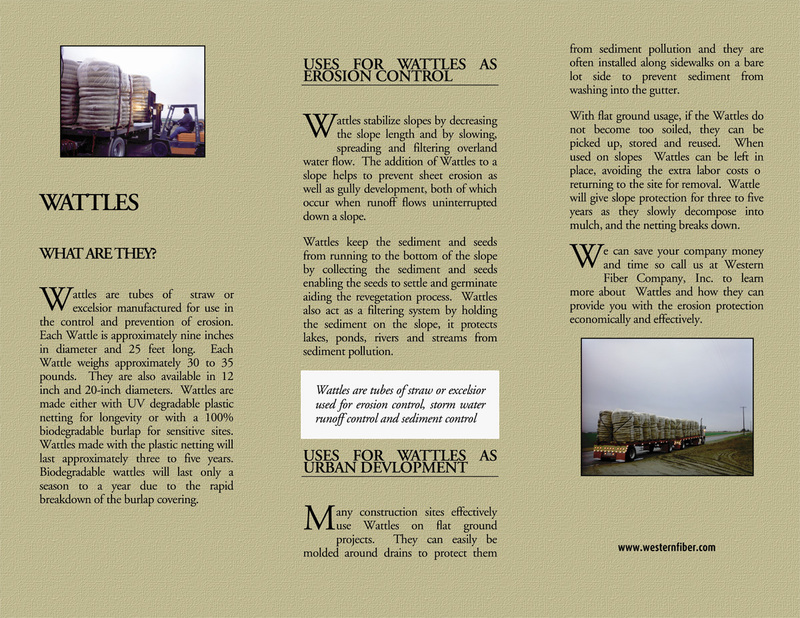 WESTERN FIBER COMPANY wattles don't impede wildlife movement and are aesthetically pleasing. They also install more easily and are more adaptable to slope applications and contour installations.